While rats were once a pet that had a lot of stigmas carried against them, today, they’re becoming known as the smart, loving, and fun pets that they deserve to be known as! Despite this growth in popularity though, many people who are new owners or are interested in owning rats aren’t yet in the know about what rats need. This is mostly because most people don’t have much experience with pet rats, but don’t worry, we can help you to figure that out. The best rat toys (and how you can choose from them) are outlined below in our comprehensive review of the top five options currently on the market right now. These toys are sure to make your new friend very happy and energetic! 1. What Do Rats Like To Play With? 2. How to Make Rat Toys? 3. When Can I Put Toys In Rat Mom Cage? 4. What Are Good Rat Toys You Can Buy? 5. How to Disinfect Rat Toys? First on our list is this interesting suspension bridge that you can add to your rat’s cage or to their play area with ease. This one comes from a brand that is known for their vast selection of pet accessories for every kind of pet. This suspension bridge toy is made from pet-safe wood and is very easy to assemble. The toy comes with non-toxic glue that you can use to put it together, or you can do so without the glue if you aren’t worried about it being permanently held together. This toy is very light, and it measures in at 3.9 by 11 by 7.9 inches. If you have the space for this toy in your rat’s cage, then you’ll find that they love to run across it. It’s not too big, so you should be able to fit it. Made from pet safe wood. Easy to assemble (with or without supplied non-toxic glue). Stimulates your pet and helps prevent boredom. This toy is interactive in many different ways. From climbing to chewing it, your rat’s mind will be super stimulated while playing with this toy. Additionally, it is also very easy to put together. The fact that it is made from pet-safe wood means you do not have to worry about your pet getting sick from it. One potential issue with this suspension bridge toy is that it is quite small when compared to the size of some larger rat breeds. Depending on what type of rat you have or how big they are, you might find that this toy is actually too small for them to easily play with. This set of five chew toys are made out of a pine material that is full of natural resin. Your pet will definitely love to chew on them! Let’s check out some other features that it offers below. This set of toys comes with one of each of the following: bark watermelon ball, small bell roller, large bell roller, small dumbbell, small unicycle. Not only are these toys cute to look at, but your pet will also like playing with them. These toys are treated with a non-toxic, anti-corrosion coating. This ensures that they will last for a long time without putting your pet at any type of safety risk. Keeping them healthy and active and helping them play around their environment in a new fun way. 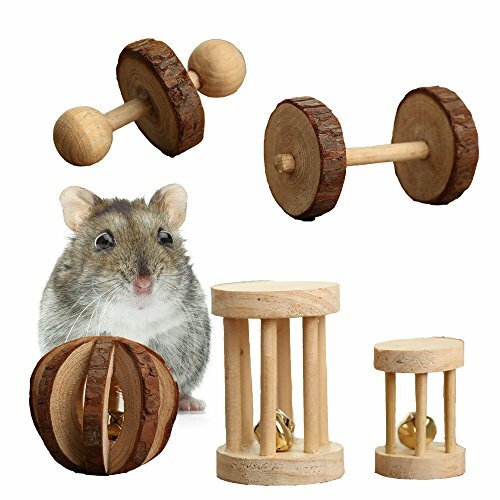 This Wooden toy Chew Toy gives your small rodent the prefect opportunity to play and work out! Function: entertainment, decompression and grinding teeth for small pet. 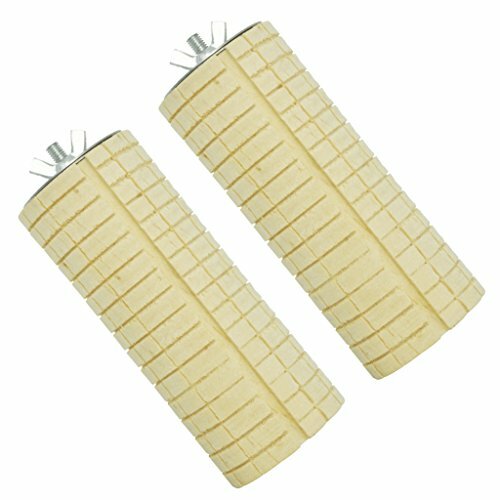 Lovely shape and delicate appearance can be used to grind pet's teeth, so that the pet's life will be more comfortable and happier. Applicable to: hamsters, chinchillas, Guinea pigs and other small pets. The best thing about this package of toys is that it has five differently shaped toys in one set. This means that you will be able to give your rat a good variety of toys to play with. You’ll find that this keeps them more interested in the toys for longer periods! Another great thing is that these toys are made out of a natural pine material that is good for your pet to chew on. Chewing on natural wood can actually keep your pet’s teeth healthy and clean, so this toy is super beneficial in multiple ways. There are some small slit openings in these toys that might be dangerous for an adolescent or small rat with small feet. The slits shouldn’t be an issue for adult rats, but you will want to be careful and mindful of this just in case. If you’re ready to set up somewhere that your rat can play or sleep at, then you might find this type of hammock net to be fun for your pet. It comes in two playful colors—green and purple—that you can choose from. 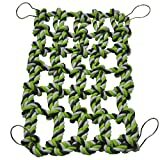 This is a cotton rope net made by Niteangel. The net has metal clips on all four of the edges so that it can easily be connected to any cage. Once in place, your pet can happily play on it. You can even connect more than one of these to each other for a bigger, suspended space. 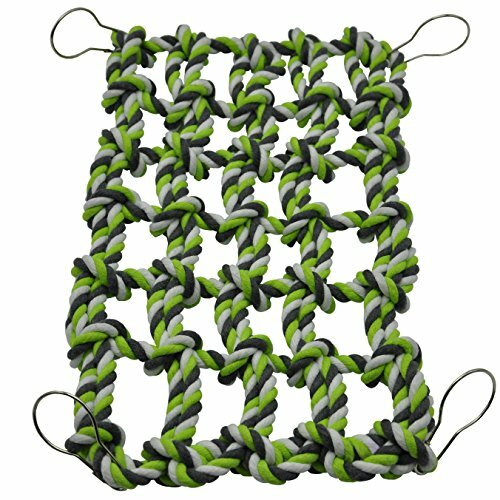 This rectangular cotton rope net measures in at 13.4 inches in length and 8.3 inches in width, which is just about the perfect size to fit most types of rat cages. 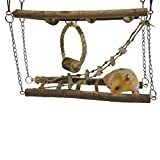 A sturdy climbing activity toy made from cotton rope, two or more hamsters could play together on it. Encourage your pets to climb and do more exercise to prevent their overgrown nails, benefits to their health. One of the great things about using a cotton rope toy like this one is that it will actually help you take care of your pet too! When your rat climbs on the rope, it will be a bit rough on their nails, hence keeping them in check. Another awesome advantage to these rope nets is that they are very thick, strong ropes. Thus, even if your rat is a bit large and heavy, you can be sure that the ropes will hold up for them as long as you have secured the net properly. One thing that you might need to modify about these nets are the hooks that are included in the package. Your rat is very smart, and they are going to challenge any toy that you give them. In this toy’s case, you’ll find that your rat might be able to bend and undo the hooks if you don’t replace them with something more rat-proof. 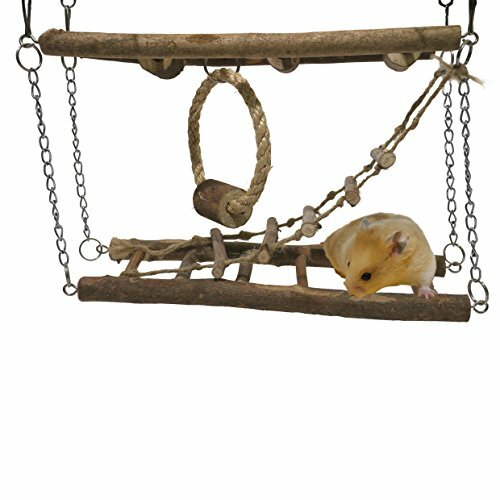 This hanging pet hammock can be put in your rat’s cage for a fun toy to swing around as well as somewhere for them to cuddle up and rest. Because, after all, who wouldn’t want to see a rat having fun on a hammock, right? This brown hanging pet hammock measures in at 8 by 8 by 4.7 inches. The chains that it hangs from are about 13 inches long, but you can adjust these to your needs so that you can hang it at any length. The hanging hammock comes equipped with four clip chains that are coated with anti-rust and anti-corrosion agents. These clips make it super quick to hang up and move the hammock around as needed. One of the great things about this toy is that it is washable! By simply unclipping it from your rat’s cage and taking off the metal hooks, you can toss it in the washer, and it will be fresh in no time! Another benefit to using this toy is that it is very durable. Thanks to the materials used and the generous double stitching done to it, you can expect that this toy can stand up to some serious wear-and-tear. The main drawback of this toy is that it’s hard to know for sure if your rat will like it, but that can really be said for any toy. Many rats love to cuddle up inside of it, but you might find that your rat does not. Thus, be mindful of this possibility. This teeth-grinding toy was designed to give your pet a designated spot to chew safely, and they’ll probably love it! Do you think your pet will like this toy? Let’s try and find out, shall we? These small, corn-shaped chew toys are made out of natural wood that is safe for your pets to chew on. Once set up in their cage, you will see how frequently your rats make their way to the toy to chew and play with it. They might even try to climb on top of it! Made of natural wood, a cute corn shape. A grinding teeth chew toy, great for hamster health. Suitable for hamster, rat, chinchillas, guinea pigs and other small animals. Height-adjustable platform, fit net spacer within 1 inch. Diameter 1-3/4 inches, Length 4-3/4 inches. One great thing about this toy is its incredible value. You get not one but two of these small chew toys in the kit, so you can set them up around the cage in different places to stimulate your rat’s mind. Additionally, it’s easy to attach and move these chewing toys around. This is good because your rat might actually get tired of always chewing in the same place. Since you can move it, they have the chance to re-discover the toy. The main drawback of this type of toy is that it won’t last forever. It will only last for about one or two months depending on how much your rat chews on it, so you need to be prepared to replace it if needed. When you’re starting to shop for rat toys, you might not have any idea where to begin. Do pet shops have special sections? Can you find great toys online? Where is the best place to start looking? Before you consider where you should buy the best rat toys, it’s important that you find out what makes up a great toy. Let’s look through the main characteristics of rat toys and help you discover how to choose the best option. You might wonder which one of these toys is the best for your rat, but the simple answer is that there isn’t a single one of these that is better than the other. The key with rat toys is to have a variety of different types of toys, so you should try to choose a toy type from this list that your rat isn’t currently playing with to mix things up. Safety should be the number one concern when it comes to choosing the right toys for your rats. In particular, you will want to make sure that the toy doesn’t have any parts that could easily be chewed off and eaten. Your rat is going to try to chew on things, and you don’t want to give them a flimsy piece of plastic to play with if it is just going to become a choking hazard. Additionally, make sure that the rat toys are made out of safe materials that are not coated with chemicals. As mentioned, your rat is likely to chew on the toy at one point or another, and it could be dangerous for your pet if the material has any type of chemical coating on it. Choosing the size of the toy for your rat doesn’t matter much unless they are very small or oversized. When it comes to things like hammocks, digging boxes, and tubes, you will want to make sure that they are all wide enough for your rat to fit through without getting stuck. Anything smaller could be dangerous. Do you have a particular theme for your rat’s cage or play area? If so, you’ll want to pay attention to whether or not your rat’s toy will fit into that design. If it doesn’t, there’s nothing wrong with buying the toy in a different color or slightly different style so that you like the way it looks. These three materials are all safe for rats to use as long as you are sure that they fit the safety guidelines we have already talked about. Remember: rat toys will end up in your pet’s mouth at some point, so you have to be very safe about chemical manufacturing risks. Rat toys come in lots of different dimensions, and the dimensions that you need will depend on what type of space you plan to let your rat use the toy in. If you want to get them a hammock to swing in that should fit in the corner of their cage, you’ll need to choose something with the appropriate dimensions. Rats will play with many different types of objects! From things that they can climb on to things that they can eat, there are a lot of different ways that you can entertain your rat with the right toys. Digging: Rats love to dig! Often, they like to dig with a goal in mind. A toy that you can bury will be rewarding for your pet when they dig it up. Climbing: Ramps and small stairs are fun for rats who like to be on the move by doing activities such as climbing up and down things. Eating: You don’t want to feed them too much, but there are some toys that you can hide a little bit of food in so that they have fun trying to get to the food as well as while eating it. Why not make it an overall enriching experience? Chewing: Finally, rats like to gnaw on things. Filling the cage with toys specifically for chewing will protect both their habitat and their teeth from them chewing on the wrong things. If you aren’t ready to invest in store-bought rat toys just yet or you simply want to have a wider range of rat toys than what you can purchase right now, making your own rat toys is very simple and easy to do! Digging box: Use a slightly deep plastic container and clean soil to make a digging box. You can bury things or plant a little bit of grass for your rat to dig in! You’ll be shocked by how much they love it. Soft tunnel: Sew fleece into a long, rat-sized tube with as many separate tunnels as you feel up to making. Use plastic to go around the circle opening to keep it open, and then let your rats run around in it to their heart’s content. Box house: By taping boxes together and cutting openings, windows, ramps, and doors between them, you can create a house for your rats to play in. They’ll love hiding out, hiding food, and hiding from each other in this type of set up. Newspaper: The absolute most simple way that you can add some new enrichment to your rat’s playtime is to ball up some newspaper and stick it throughout their other toy areas. They’ll want to pull it apart, play with it, and dig around it as much as possible. If you have a pet rat that has just given birth to little ones, congratulations! You now have between seven and fifteen more little babies to take care of. Don’t worry; mom will do most of the work. Once your rat has given birth, the babies will need some time to grow before they can be touched or played with. In fact, they won’t really start running around for a while, either. At about four weeks, you should separate the male and females. By six weeks, the babies should be ready for moving on to their new owners if you’re giving them away! You can put toys back into the cages around three to four weeks, as the rats will be big and strong enough to eat solid food by this time. As you would with an adult rat, it is important that you don’t put any toys with small parts that could be swallowed or anything that is toxic into the cages with the babies. All of the rat toys mentioned on today’s list are good rat toys that you can buy! They’re some of the top options, and you can definitely find a winner among them. Depending on the type of toy that you get for your rats, you may not know how to clean and disinfect them properly. It’s important to clean your rat’s cage and accessories at least once a week to prevent any illnesses or issues from developing due to an untidy living area. Cloth toys: If you have a toy made out of fleece or similar material, wash it in very hot water with pet-friendly soap or no soap at all. The hot water will help remove any build-up and keep the cloth safe for use. Wooden toys: Soak them in hot water, possibly with some type of nontoxic wood cleaner. Then, let the toys dry in the sun for up to a week. Paper toys (i.e., toilet paper, cardboard): The best thing to do with these type of toys is to, quite simply, replace them. These materials aren’t easy to clean, and replacing them saves you both time and money in the long run. Among these options for the best rat toys, we have found that the Niteangel Cotton Rope Net is one of the best ones, thanks to the blend of value and fun that it offers. This toy can be customized to fit your cage very easily, and you can even add more than one of them together, which is something rats really enjoy climbing on! No matter which type of toy you choose, you’ll be making the right choice by stimulating your rat’s mind during playtime!